This page of resources belongs to the Homemaking Resource Library. For many years we had a vegan kitchen, about fourteen years. My kids were raised on a mostly plant-based diet - all plants at home, other options available out of the house. When the kids were teenagers we introduced animal products into the home, because I wanted to. And you can read all about how that change happened in the Becoming Un-vegan series. It's a long story and needs a few posts for the telling. We are currently a mixed-eating household. Vegan, mostly-vegan, and full-on omnivores. The posts here are mostly from those fourteen plant-based eating years, with the addition of my personal becoming un-vegan story. One of my post significant written contributions to plant-based recipes was the short ebook I wrote on meal-sized salads. You can read more about that and download for free here. For more vegan and plant-based inspiration you can follow my daughter's vegan instagram account. For menu planning and kitchen work related posts see this resource page. The ethics of eating animals (and why I do it anyway) - Every time I eat anything, plant or animal, my living depends on either taking something from another being or the death of another living thing. How to define health and what food guru can I trust? - I got fed up with feeling like I couldn't trust myself about my own body and I got so tired of thinking about it all. Throwing the baby out with the bathwater - At forty, in the crucible of a mid-life crisis, I had to disassociate myself from the whole mess, from plant-based eating associated with my husband being an authority in my life and from good cook = good mom. Falling Apart - I had been onboard with this diet for many years but I was starting to ask questions and have doubts. Becoming mostly-vegan ~ Following an authority I could trust - I wanted to be a good wife and support my husband's health and his beliefs. Becoming Un-vegan ~ An Introduction - A couple years ago I said "enough" to our mostly-vegan diet. Herbal Mushroom Chai (and some talk about adaptogens, stress, and anxiety) - A herbal chai recipe that packs an immune-supporting, anti-inflammatory, and adaptogenic punch. Excellent Warm Drinks for Winter Wellness - One of the simplest tools I use to help ground, cleanse, and restore me is sipping on nourishing hot beverages each day of these winter months. Whisked Winter Cocoa - Our favorite, sugar-free, whole-food hot cocoa recipe. Blender Pancakes - Updating my old gluten-free pancake recipe with a better tasting pancake. Red Melon Slushies & Strawberry Ice Cream - Two great summer recipes, both naturally sweet and delicious. Best Falafel Salad Ever (or my favorite to date) - What makes this falafel recipe different than other recipes I’ve tried is that the beans aren’t cooked. One Pot Wonders - Tips and tricks for one pot vegan meals, and two recipes. Roasted Tomato Soup - Late summer is tomato season and it's the perfect time to be making roasted tomato soup. My No-Nonsense Strategy for Picky Eaters - The basic strategy has been: this is supper, if you're hungry you'll eat it. Whole Food Vegan Pesto - We've been eating fresh garden basil here for the past couple weeks and this recipe is one of our favorites. Peanut Sauce Noodles - The combination of sweet and salty, the creamy peanut butter, the crunchy cabbage, and flavorful garlic make this recipe a hit every time we prepare it. Natural Cold Remedies - A few of my favorite winter cold remedies. Our mostly plant based diet - Our family's plant-based diet food guidelines and vegan kitchen. Vanilla Extract ~ An easy handmade gift - I make our own vanilla extract; it also makes an easy holiday gift. Baked Beans - Our favorite baked beans, usually eaten for Saturday night suppah. 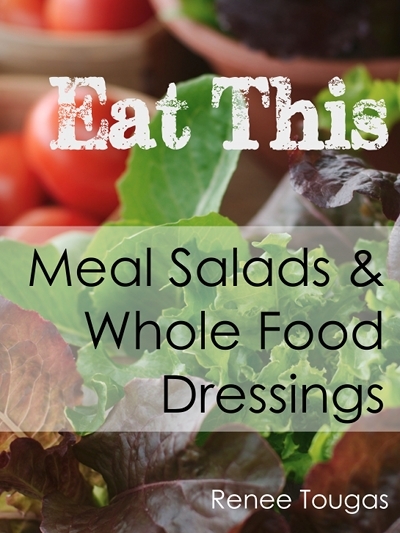 Salads: what we eat for lunch - How we came to eat meal-sized salads for lunch and our favorite salad recipe. Gluten Free Pancakes - Three-in-one recipe: gluten-free baking mix, corn-free baking powder and a pancake recipe! Animal, Vegetable, Miracle - a review - Is it possible to be vegan and follow these principles?